A Christian fellowship of men, promoting love among all people. Winter in New England can be cold. This is especially true for the homeless men and women Starlight Ministries staff and volunteers minister. This December meeting we are asking members to bring to the meeting a package of new socks or underwear to donate to Starlight Ministries. 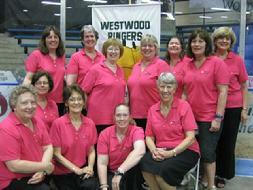 The Westwood ringers home hase is the First Baptist Church of Westwood, Massachusetts. The church's handbell program begain in 1965, when a gift of two octaves of handbells was received.The bells were first used by the young people of the church. By 1970, a third octave of bells was added to the set, and the group expanded their repertoire. They are members of the American Guild of English Handbell Ringers, and have participated in many local and national ringing events. Teir first major bell festival was at Jeckyll Island, Georgia, where they performed several solos and participated in ensemble ringing with 1,000 other bell ringers from alll over the United States. Their travels also included a motor trip through six states, with concerts in Pennsylvania and New York. They have continued to add handbells to their set, and now ring five octaves of handbells and four octaves of hand chimes. In the summer of 1999, they traveled “across the pond” for a nine day concert tour in England. Since then their European concerts have taken them to Germany, Austria, and Ireland.